We launched from the Palmer and headed south on Michigan Ave. Our first stop was Yolk, an eatery that we’ve frequented before. Anne had an egg scrambler, with key lime pancakes. I had avocado toast, with fried capers and some of Anne’s too. The pancakes were great. Breakfast was interrupted by an angry young man’s outburst. He flipped half-a-dozen chairs and then marched out. After a while, two of Chicago’s finest arrived. They were soon followed by backup. It was a coffee shop after all. Did someone say free donuts? The day’s main event was the Field Museum. We started with mummies, the regular Egyptian kind. We had a guide though. Next up was Sue the T-Rex. She is now installed in her new home. Màximo the Titanosaur has taken her old place in the central hall. We then Honey I shrunk the kids, an exhibit that enlarged a foot of soil into a full length exhibit. We got some sit-down time and watched a 3D China movie. It was all about the Terracotta Warriors. We followed this up with more China and another special Chinese show. More mummies, both Peruvian and Egyptian. Then the closing bells started ringing. There was still plenty of daylight left at five. 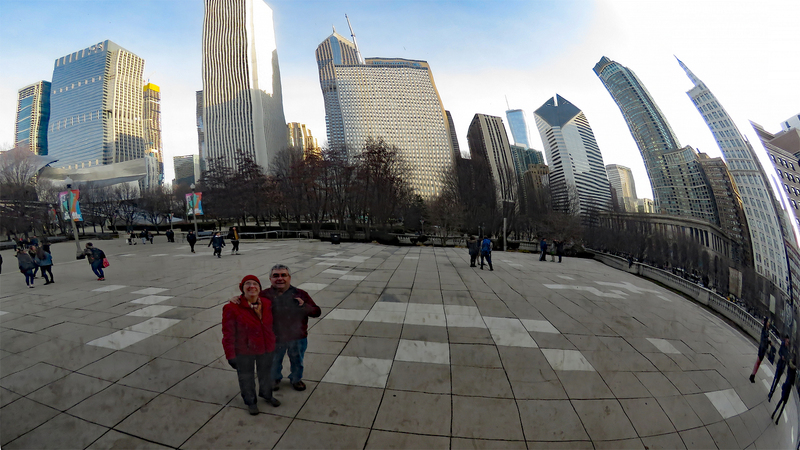 We walked the length of Grant Park and ended up in Millennium Park, at the Bean. Officially the Cloud Gate, but call it selfie central. Italian for dinner and then less than a block to the hotel.